Four McDonald High School Students Earn Prestigious Service Awards! Members of Girl Scout Troop 344 earned their 10th overall (8th consecutive Gold Level) President’s Volunteer Service Award for community service! In order to obtain gold level, a group must serve 1,000 or more hours with each member contributing a minimum of 25 hours. The troop served in excess of 2,000 hours. These students routinely go above and beyond just completing projects to help others. Projects completed to earn the award range from local to global. Projects completed to earn the award range from local to global. Students partnered with organizations such as AdoptaPlatoon, Animal Welfare League, Central Baptist Church, Churchill United Methodist Church, Heavenly Beginnings Preschool, McDonald High School, McDonald Village’s Woodland Park Retirement Apartments, Samaritan’s Purse, Second Harvest Foodbank of the Mahoning Valley, Student Life Ministries, Thunder Elite Fastpitch, and Woodland Park United Methodist Church. 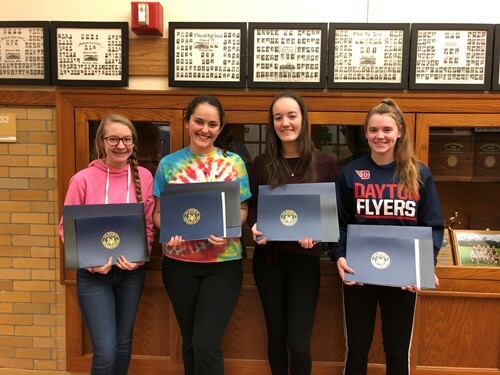 Troop members received a letter signed by President Trump, a gold level pin, and a recognition from the offices of US Representative Tim Ryan, Ohio Senator Sean O’Brien and Ohio Representative Glenn Holmes.